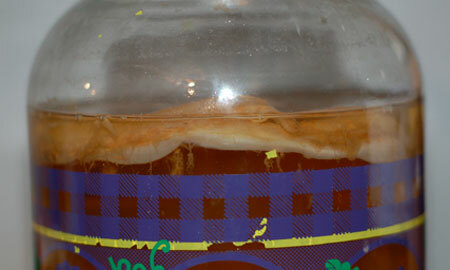 I was given my very first kombucha SCOBY by a friend way back around Christmastime—what looked to me a bit like a jellyfish preserved in vinegar. I had never actually tasted kombucha before and was honestly a little intimidated, even though I have been comfortable with other sorts of ferments for years now. Just a few weeks later, however, I signed up to give a presentation about fermented foods in one of my classes, and decided I might as well try using my gifted SCOBY to brew kombucha for the class. A gallon or so of sweetened organic Darjeeling fermented in my basement for a month or so before I finally poured some off to sample with my presentation partner. She actually knew what it was supposed to taste like and declared it delicious, and I was actually pleasantly surprised myself—a little sweet and sour, almost like sparkling apple cider. Being over halfway through my pregnancy at this point, I made sure to drink only small portions daily, to give my body time to get used to it without too much detox. 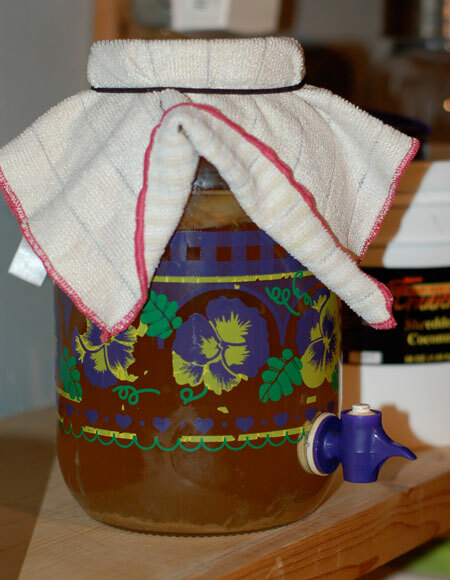 Since then, I have been making continuous-brewed kombucha using a gallon glass jar with a spigot—a good size since I am really the only one in the house drinking it and don’t want to overdo it myself. I have to admit that I forgot to refill the jar for several weeks at the end of the school year, and the batch ended up souring into vinegar. But if you’ve read my post about home-fermented vinegars, you won’t be surprised to learn that this discovery didn’t dampen my enthusiasm one bit—in fact, for me, it virtually doubles the usefulness of kombucha! I drained off most of the vinegar and refilled the jar to keep brewing; I’ve been putting the vinegar in marinades and salad dressings like ACV. I also started using it for a hair rinse (with a few drops of rosemary EO) instead of ACV, and was pleasantly surprised to find that it took care of the static problem I had been having since cutting off 10″ a few weeks prior. I’d love to try infusing it with dried flowers or herbs as well. My original SCOBY has already produced several babies, one of which I gifted to my presentation partner. This last time I topped off my jar, I noticed that the original mother was looking pretty thick and leathery, so I decided to peel it off and return just the rather substantial baby to the jar instead. 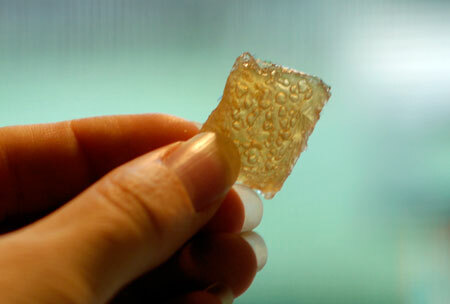 I also opted to chop up and candy the extra SCOBY rather than composting it, and I’m glad I did! 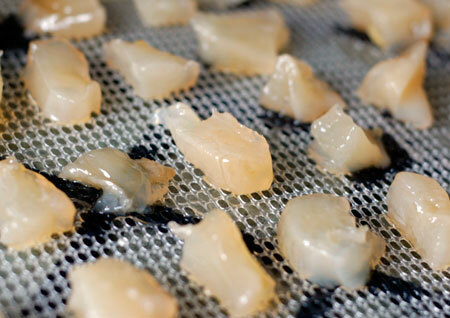 Using this post as a guideline, I soaked the pieces for 24 hours in simple syrup infused with fresh ginger, then dehydrated them for about 24 hours at 105F to preserve their live probiotic status. The finished candies are like apple pie flavored gummies, surprisingly tasty. 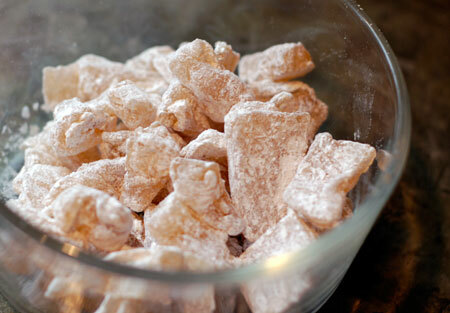 I tossed them in powdered sugar to keep them from sticking together, and have been using up the ginger soaking syrup in smoothies as well—it soured quite a bit in that short time period, so it has its own probiotic kick. 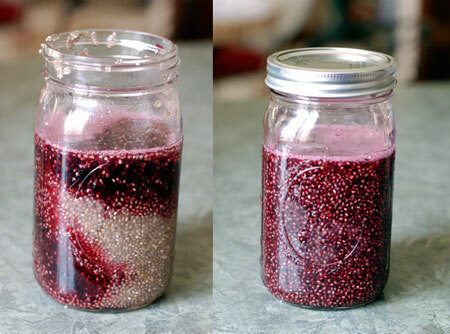 Finally, I thought it might be fun to try making a flavored chia kombucha drink like the ones you see at Whole Foods. I poured some kombucha into a quart jar, dumped in some chia seeds, and proceeded to shake up the jar every time I went in the kitchen for a few hours (make sure to release the pressure in the jar by loosening the lid periodically if your kombucha is as effervescent as mine). Eventually the chia gelled and distributed evenly in the liquid instead of clumping at the top, and I refrigerated it overnight until I was ready to add some flavoring the next day. I used homemade grape juice in what probably amounted to a 1:2 ratio with the kombucha gel, and when I shook it up one last time, I ended up with a really delicious sweet-tart grape chia drink, the perfect pick-me-up after a long afternoon walk. Ever since then, I’ve been keeping a jar of kombucha-soaked chia gel in the fridge all the time; 3 cups of kombucha with 1/2 C chia produces a good consistency for me. This way I can either customize it with juices on a glass-by-glass basis, or just add spoonfuls to my morning smoothies. A glass of grape chia kombucha was actually the last thing I consumed before heading to the hospital for Theo’s birth! I am so excited to try your Kombucha Chia gel! Thanks for the inspiration.